How many rough drafts, spoiled drawings, and blurry photos have you created before that stroke of serendipity? Are you looking at a failure, or an important stepping stone toward a masterpiece? If you’re waiting for inspiration, you might be left waiting, giving up time that could be better spent creating. Get writing, get your watercolors out, pop your camera in your pocket and do a photowalk in your neighborhood. If you focus on being consistent with process, inspiration will find you, and what you produce will show it. I love this attitude – get the process right and the rest will follow with a bit of luck. The idea that inspiration simply strikes out of the blue is (usually) nonsense, much better to work hard and enjoy the process and if gods results are going to come, they’ll come. Sorry…that should read ‘good’ results not ‘gods’ results – I’m not suggesting divine intervention is at work! Good point, because had Edison had his way we would all be operating under the inefficiency direct current to power our appliances. Obviously, divine intervention was at work. Inspiring! There are peaks and valleys in creativity and times that you need to lie fallow. Thanks for sharing this! Very motivating quote, thanks for sharing! Attitude in its true spirit. I love the positive attitude. I feel better now because I’m still working passed my 10,000 ways. Edison is a very strange example for any writer. He employed a great many other people and wasn’t ashamed to take credit for their work. His patents were the culmination of a collective effort. His successes have little or nothing in common with the more solitary and individual efforts of a writer. I’m not deeply familiar with Edison’s work methods. I agree the act of writing itself is solitary, though the final product is the result of a series of people. Writers often rely on one or more trusted readers for critical feedback, editors help shape work, and copyeditors and proofreaders ensure that the final product is error-free. In the end the writer takes the credit for the published book, article, etc., though most published work is a team effort to some degree. waiting for inspiration is just some people’s way of staying idle and being lazy, its cool if we just start doing something, anything we love. Because it our thing we’ll definitely get better and best at it. Just start and, once started, just keep going. That’s how it works. It’s in the doing, not in the yearning. Mistakes are not mistakes if you learn something, they are lessons! Great post. I agree that we can’t base all of our work solely on excitement. If we can sustain through the less than inspiring moments then it’s real. If we rely only on flashes of lightning we’ll be waiting every day doing nothing until the storm roles in. Thanks for sharing and giving an added boost to the process. And failure is not a failure but it is an inspiration for us to keep on going until we reach our dream! I like it. Motivational. Also with every try you learn something that could get you closer to that lightning strike that maybe wouldn’t come if you didn’t build up the experience of all the failed attempts. To learn from what was a result of failure and come up with another way to solve the issue, problem, or spark a new idea. Not everything will always result in complete failure in our lives. Just another approach to discover how far we can improve our creative. I think maybe Nikola Tesla, who worked for Edison, would have had something to say about this. Tesla was really the inventor and ideas man, whereas Edison was the entrepreneur. Should we as writers draw inspiration from others in the same way? Great point! Curious to know what others have to say about it as well. Great conversation starter! @silvercouse… you are absolutely right! Taking other’s ideas and selling them is plagiarism in the world of writing, so I vote that “we as writers” should stay away from that practice. However, I would hope Edison’s philosophies, as outlined in this post, are original, and it’s certainly worthy to take note of those and keep them in one’s cache of inspirations. I’m glad you appreciate the overarching message. Sometimes it’s about the words, rather than who says them, eh? I look at those quotes and it reminds me to stop procrastinating and start writing. This reminded me of myself, and now rushing to finish all my assignments as they are all due tomorrow. Fried brain I would say. This is really inspiring and comforting also in a sense that may be one day will be the best.. I wish I had a Nikola Tesla to take notes from, or at least a team of underlings to brainstorm for me. Very inspiring post! A reminder that we all have to start somewhere. Very apropos. Just did 5 drafts before posting my most recent blog! Just added that quote to my quote wall. 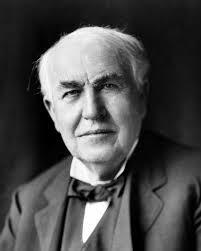 I love finding new inspirational quotes especially when they deal with someone has inspiring as Thomas Edison. Absolutely. I mean, after all, most of us are lazy— if we dare to admit it. Nothing can be done if we don’t start doing it.